Wm. B. Eerdmans Publishing (Grand Rapids, Michigan, 2016). Few areas of thought today are as exciting and as important as the conversation between religion and science. Unfortunately, these two books don’t contribute that significantly to this dialogue. Both authors, with strong backgrounds in science and far weaker backgrounds when it comes to theology, disappoint the reader in different ways. 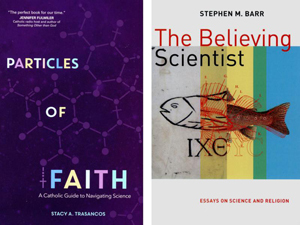 Stacy Trasancos, a chemist and a Catholic, teaches online from home while she helps raise and educate her children, and she talks early in her book about the excitement of seeing the connections between science and faith and does so well. However, besides Pope Francis’ encyclical “Lumen Fidei” (“The Light of Faith”), many of the theological sources she uses are pre-Second Vatican Council, such as St. Thomas Aquinas and the fathers of the church, helpful in the tradition but not as useful here as the many contemporary voices on this topic. Authors such as Father Pierre Teilhard de Chardin, Franciscan Sister Ilia Delio, John F. Haught, Father Thomas Berry, Father Diarmuid O’Murchu and Judy Cannato merit not a mention here at all. At times her questions as well as her answers fall short. Examples of her questions that seem to be the wrong ones include: “Is the Atomic World the Real World?” “Does Quantum Mechanics Explain Free Will?” and “Did We Evolve from Atoms?” Her discussion of Adam and Eve and evolution seems to be woefully lacking in an understanding of the historical-critical method of interpreting Scripture, first encouraged by Pope Pius XII, which might see the Genesis account as true in another sense than scientifically. This is a worthwhile effort, but unfortunately she is hindered here in her treatment by a limited and overly dogmatic theology, which changes the whole conversation. The bulk of Barr’s book, as indicated by his subtitle, are essays, largely book reviews or comments on blogs, as well as an occasional lecture, which have limited usefulness to the reader unfamiliar with the specifics of what he is referring to. One hopes for more helpful books than these in the conversation between faith and science soon. Finley is the author of several books on practical spirituality, including “The Liturgy of Motherhood: Moments of Grace” and “Savoring God: Praying With All Our Senses,” and has just finished teaching in the religious studies department at Gonzaga University.